Five Ancestors is also known as Ngo Cho or, in Mandarin, Wu Zu Quan. This style of Kung Fu is a “Southern” branch. It’s claim is to be a direct branch of the Shaolin Temple. The style of Shaolin, not everyone knows, is more of a combination that a pure form of its own. During the Qing dynasty, under Manchu rule, the high level skills contained in the Shaolin Temple were worrisome to the Manchu overlords since it represented a “sanctuary” for rebels and skilled boxers. It had to be removed. Through treachery the Manchu elite had the Temple burned down and, as the story goes, five top masters escaped forming the Five Ancestors style. At least this is one version of the origin. The Five Ancestor Kung Fu originated in southeastern China, Fukien province. Ngo Cho is from the Amoy dialect. 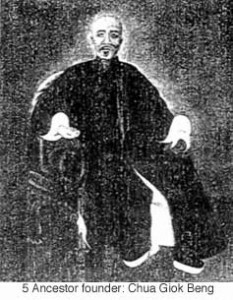 The founder or at least first formerly recognized transmitter of this system, Chua Giok Beng (Chua Kiam), was born in 1863, into a wealthy family. His home village was Pan Be. He began his training under Ho Yang. When his teacher died he followed the funeral caravan back to Ho’s home province of Honan. On the return he searched out other Kung Fu instructors staying away from home for ten years. When he retuned his family’s properous sauce business was now on the deline but Chua spent all his time on assimilating and systematizing what he had learned into a new fighting form. Once he was satisfied he had created a complete system he opened his Lin Li Tong (Humanity Hall). Once open he took on many challengers and defeated them all gaining great respect for his new Five Ancestors Boxing. This was augmented but Chua’s skill with herbs and his righteous character. Though passing a military test and gaining a rank with the government he nonetheless abstained from joining an administration he distrusted. Instead he continued his single-minded refinement of Kung Fu. Chua also continued his open-hearted attitude to the arts. Possessing “light body” skill himself he had his home built with only windows. Any boxer who could enter under his own leaping power was welcome to visit and stay with Chua. Eventually Chua gave up running a school and spent the rest of his life traveling, dressed in ragged clothes, and teching his art throughout China. But he left behind a group of students which became known as the original “Ten Tigers of Ngo Cho Kun”. .
2. 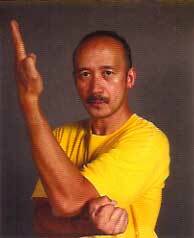 Lo Han (Chap Puay Lohan or 18 Lohan): This ancient form of Shaolin contributed the footwork; tight, fast and deceptive to the system. There are eighteen Lohan or Immortal forms, one for each of the legendary Chap Puay Lohan or Eighteen Immortals. However, most Ngo Chor practitioners are attached to just one form of Lohan..
3. Ta Sien Pek Kwar (Cay Teng Tai Seng): The Celestian Great Sage Monkey Fist of Chinese Buddhist mythologycontributed low angle attacks, leaping, dodging, evasion and speed. It has a distinctive hand claw and moves maintans a facing action with the head to imitate the deep set eyes of the monkey. Great for smaller, more nimble players. 4. Tai Cho is the style most people know as Tai Tzu or Great Ancestor named after Zhao Kuan Yin (Sung Tai Chor), the founder of the Song dynasty. Zhao was alos a military genuis and a martial arts enthusiast. He even visited the Shaolin Temple. His styles, calimed by many people since ti derives prestige from eing associated with an Emperor no less, utilizes one leg presses, held kicks, deep stances and other methods to create deep kicking actions. At one time it was only taught to family and members of the royal court. 5. Tat Chun: There is some ambiguity to the fifth style though all stories point to a Shaolin origin. Called Bodhidharma or Tamo, it is also known as Ngo Mei (the teacher of the woman: Wing Chun) style of Shaolin contributes Iron Body conditioning to the style. In the Ngo Mei version there is also an emphasis on body conditioning since she was to fight men. The attack sequence is proto-Wing Chun with tight, fierce actions and finger strikes. Kan was born in Pa Kong, Yong Chong state, Hokien. Orphaned in childhood he was a natural martial artist. After studying both boxing and bone doctoring for many years he began a school. He received an invitation to head a team in the famous Nanking tournaments after his student, Lim Poh Shan attended the famous Nanking tournament and gained a prize, Mr. Kan gained prominence and recognition from the Chinese government. He opened a school in Singapore. His reputation as both a teacher and a doctor grew. During the fight against the Japanese he would treat people for free. His students number many but outstanding are Lim Poh Shan, and his own three sons Aw Hai, Aw Cheong and Aw Nam. Posted December 5, 2003 by Plum Staff. Comments are closed on this post, but you can trackback. Tagged with: Five Ancestors, Ngo Cho, Wu Zu Quan.